Kam Yuen occupies one of the largest offices of any chief executive in Hong Kong, on the 46th floor of the IM Pei-designed Bank of China building with views of the harbour and the hills of the city. An exercise bicycle stands behind a leather couch and massage chairs, while gold figures are placed on tables and window ledges. The figures are there for luck. Mr Kam is a great believer in luck, particularly his own. He might well be, given that he founded two companies, Golden Meditech Holdings and China Cord Blood Corp, both of which are now listed. Shan Weijian, the former rainmaker of US buyout group TPG, has a stake in the first and KKR a stake in the second. Analysts estimate Mr Kam could be worth US$100m, based on his shareholding in Golden Meditech alone. Mr Kam is the face of the new China, personifying both its strengths and limitations. Like many entrepreneurs, he made his fortune by spotting an arbitrage rather than by coming up with a breakthrough in product innovation or technology. And while Mr Kam succeeded largely through his own initiative rather than through connections, today he is courted by princelings, and his ties with influential people help his business flourish. “I have never thought I would not succeed,” he says, waving a cigarette. Mr Kam, who is 51 though he looks far younger, grew up in Beijing. Ignoring his parents’ wish that he become a doctor, he studied at one of the city’s foreign language institutes. Having failed to learn English, Mr Kam attempted Japanese more successfully. of a Chinese state-owned enterprise, the young worker received a pittance. So Mr Kam cast about for a more lucrative means to support himself. He soon discovered that Japanese hospitals were constantly discarding medical equipment and replacing working machines with the latest generation of medical equipment – paying waste removal firms good money to get rid of the older models in the process. The Japanese proclivity to throw out what anywhere else would be considered perfectly respectable goods from cars to couches is well known. But Mr Kam saw the business potential in this proclivity. He went round to dozens of Japanese hospitals and convinced them to give him their used X-ray, ultrasound and other machines for free and then sold them to Chinese hospitals. Eventually, though, the magnanimity wore thin and Mr Kam says he was told he ought to begin paying for the equipment he was acquiring at no cost. That was a problem for him because he received local currency when he sold the equipment to Chinese hospitals while he needed yen to pay the Japanese. So he had to come up with something to sell in Japan to earn currency there. Mr Kam, a devout Buddhist, spotted potential in an unlikely quarter . Japanese temples do not pay taxes and take a huge cut of the proceeds of funerals held there. The young entrepreneur decided to supply marble tombstones to the temples, importing them from China “to fix my foreign exchange problem”. The company includes the first nationwide hospital management operator in China that is wholly foreign owned, as well as a medical devices segment. 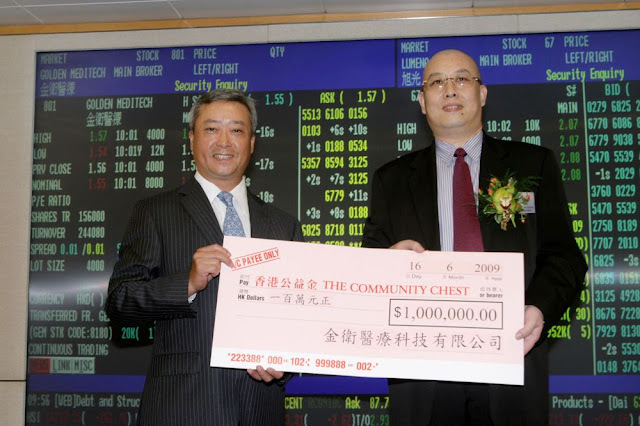 During the year ended March 2012 profit after tax dropped 48 per cent to HK$84m, a decline Mr Kam attributes to the volatility of financial markets. Given his own confidence in the business and a sense that current stock prices fail to reflect the intrinsic value of Golden Meditech, he told shareholders in June that he was increasing his own stake to 22.2 per cent. Like so many companies in China, Golden Meditech is a one-man show. Disconcertingly from the point of view of corporate governance purists, Mr Kam is chairman, chief executive and chief compliance officer. To him that makes perfect sense.